this week we'll hear from some of thailand's fantastic shadow bands & their surf-rock rollicks through the classical repertoire! the shadow movement was the brainchild of maestro phayong mukda, who had already begun experimenting with updating thai classical melodies to a latin/big band format. to complement the changing live music scene of 1960's bangkok, which was moving from spacious dancehalls into more intimate nightclub settings, phayong saw a need to condense his modernized ensemble. following a wildly successful asian tour by cliff richard & the shadows, phayong settled upon a similar combo of electric guitar, organ, bass & drums, and to emphasize the compact nature of the group, he called them "pocket music" (which also happened to be his own initials!). he gave his adoptive "son" khabuan mukda the lead organ slot, backed by chakkrin rasana on guitar & don sonrabiap on the drums, though chakkrin soon left to join rival organ star noppharat thiposot's band, johnny guitar. p.m. went through several more line-up changes, first expanding to 7, then settling down to 5 as backers for drummer-turned-frontman don sonrabiap in the 70's. 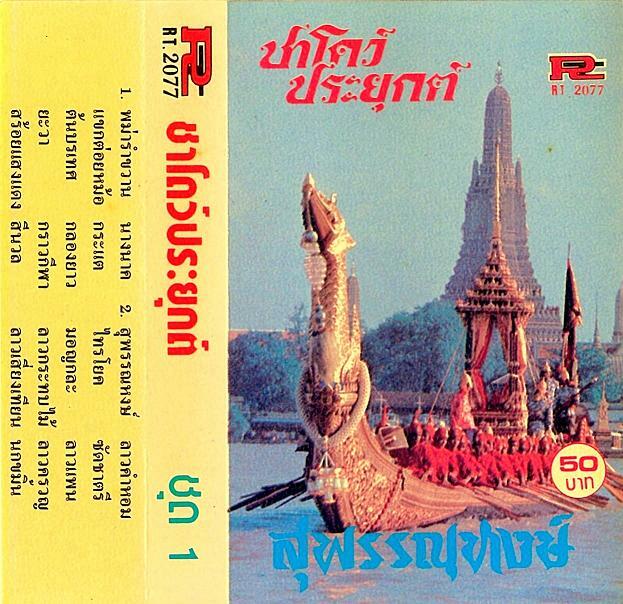 shadow music seems all but forgotten in thailand, but you can find lots internationally, either anthologized by sublime frequencies or online at radiodiffusion internasionaal, as well as in a great recent post at brain goreng... enjoy!! thanks peter! long live thai shadow music. I have a LP with many of these songs called "ชาโดว์ประยุกต์ Modernized the Shadow". I was told that it was by The Son of P.M. but judging by the tracklist here it seems more likely that it's a compilation with Johnny Guitar and P.M. Pocket Music tracks. There's three songs on the LP not on this cassette: โสมส่องแสง (Sohm Song Sang), พม่ารำขวาน (Burma Ram Kwarn) and มโนห์ราบูชายันต์ (Manora Buchayan). As is typical with a lot of Thai records any information about who/what/when is nowhere to be found except a short note on the back cover: เรียบเรียงโดย จักริน รสนา, ขบวน มุกดา, นพรัตน์ ทิพย์โอสถ. I presume those guys are chakkrin rasana, khabuan mukda and noppharat thiposot. These Thai shadow groups must either have been incredibly prolific at the time or had their music repackaged over and over again as there's a huge amount of LPs, EPs and cassettes to be found. yeah, i'd say it's more to do with repackaging than prolificacy, although they did record alot for the short time they were around. i believe "manora buchayan" & "som song saeng" are both by p.m. pocket music, as is "burma ram khwan", which is actually track 1 here. and yeah, those are the guys; khabuan from p.m., noppharat from johnny guitar and chakkrin from both! I would not say that shadow music is all but forgotten. In the past few weeks I have seen a wong shadows band belting out cliff numbers, two Elvis impersonators and a very good Beatles band in Bangkok. Every year there is a large 60's-70's 'its yesterday once more concert' in Pratunam, Suthep along with wong shadows and Elvis makes a nice change. The audiences of course are a very different ethnic one from luktung and morlam concerts. sorry for the confusion.. i didn't mean to imply that surf rock or the 60's sound have died out in thailand, but rather that the "shadow prayuk" trend presented here (that is, transposing classical numbers into said settings) is no longer extant, and that these old recordings have not made it to the re-issue circuit. would you agree? I really love this stuff. Goes great with chiba and an ariel pink chaser! Thx for it! Agree that there is no commercial interest in this, pleng ho is another such genre. While I have also seen some very good pleng ho performers around no releases that I have seen, except some influences in new songs occasionally.